Review: S.A. Stovall’s Ranger Station Haven is one of my favorites from last year’s DSP Advent series, so I was highly ecstatic when I saw a sequel was available on DSP’s Coming Soon page. I wouldn’t mind reading about Carter and Owen again, especially since the blurb promised them adopting a couple of brothers this time. 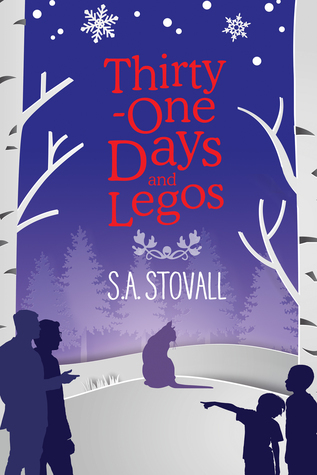 Thirty-One Days and Legos is written from Carter’s perspective as he is dealing with the newest changes in his life, a.k.a. two kids in the process of being adopted (and a cat!). With his family background, Carter is not the warmest of the couple (that’s Owen’s job) so I can see how he struggles a bit. I enjoyed reading about Carter’s interactions with the kids. While I wish Carter was more affectionate, I also liked that Carter stays as grumpy as he is from the previous book. It means that his character is quite consistent. 🙂 I still believe Carter is trying and the book still offers a hopeful Christmas spirit. I think Carter is going to be just fine, and he’ll be a good father for the two boys. Probably the strict father in comparison to Owen *laugh*.